Obtaining brief instructions, drafting and sending a letter of claim pursuant to the Practice Direction- Pre-action Conduct and Protocols by first class post and email (where possible). Arranging for issue and service of the claim form by the appropriate court/court service and obtaining judgment in default of an acknowledgement of service or defence. We could estimate matters could take 6 to 8 weeks to resolve on the basis that the other side promptly make payment on receipt of judgment in default. If it is necessary to take enforcement action, the matter will take longer to resolve. The above costs apply where your claim is in relation to an unpaid invoice which is not disputed and enforcement action is not needed. 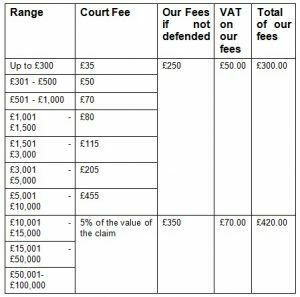 If the letter of claim is acknowledged or if proceedings are defended our firm’s charges will be calculated based on the time engaged acting on your behalf by the appropriate level of fee earner. Our standard hourly rate is £120 plus VAT, however if the matter is more complex it will be dealt with by a more experienced solicitor/Director at an hourly rate of £200 plus VAT.